In 2010 I will embark on a quest across the U.S. to find the World’s Best Bloody Mary. As I mentioned earlier this week, I’ve become obsessed with Bloody Mary’s. Don’t worry – this isn’t my new “go to” and I won’t be a freak and order one the next time I’m drinking with you at a local dive. Rather, I enjoy drinking a spicy Bloody Mary over brunch. While I can’t share with you a recipe for the perfect Bloody Mary (since I haven’t found it yet! ), I thought I would share with you some fun facts about the beverage to help you be the coolest kid at your next brunch table. · The Bloody Mary was said to be invented by Fernand Petiot at Harry’s Bar in Paris, France, and was originally called the Red Snapper. · There are a few folklore tales about who exactly “Mary” is. One story says it’s after Queen Mary of England. Another says the drink was inspired by actress Mary Pickford. Another story, which is my favorite, says it was named after a waitress who worked at a Chicago bar called Bucket of Blood. · Speaking of Chicago, according to Wikipedia, the Pump Room (which is a block from my apartment) started the trend of serving the Bloody Mary with a celery stick by the request of a guest. However, one of my favorite local bars Butch McGuires also says they were the first to introduce the celery stick. Do I smell a bar fight!? Butch's Bloody Mary's are good, but they need more of a kick, so I just add more hot sauce. The photo I use here is from Poor Little Rich Girls (newsletter). 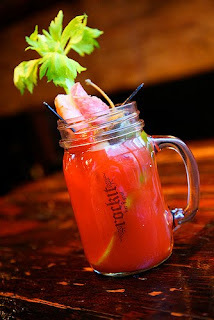 It’s a Bloody Mary from Rockit in Chicago. While their bloody mix wasn’t that great, the fixins bar is Ah-mazing! Shrimp, ham, a plethora of olives…I die!